Turmeric (Curcuma longa) is a spice, widely used in Asian cooking. It is a rhizomatous herbaceous perennial plant, in the ginger family, Zingiberaceae. Turmeric plants are widely grown in tropical areas of India, where over 70,000 acres are cultivated every year. The plant has long leaves, surrounding spikes where small flowers form. 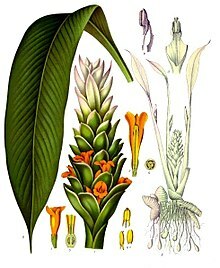 However the root, or ‘rhizome’ of the turmeric plant is harvested, in much the same way as ginger. The turmeric rhizome takes about 10 months to grow before it can be harvested; it is then boiled, cleaned and dried in the sun. Most of the harvested turmeric is ground up and sold in jars for use in cooking, however the fresh root turmeric can also be used. ↑ "U.S. National Plant Germplasm System". npgsweb.ars-grin.gov. Retrieved 2016-09-07. ↑ Chan, E.W.C. ; Lim, Y; Wong, S; Lim, K; Tan, S; Lianto, F; Yong, M (2009). "Effects of different drying methods on the antioxidant properties of leaves and tea of ginger species". Food Chemistry 113 (1): 166–172. doi:10.1016/j.foodchem.2008.07.090. ↑ "Curry spice could alleviate cystic fibrosis". New Scientist. Retrieved 10 November 2015. This page was last changed on 2 August 2017, at 00:52.